Tales of the Saugus Café, by Jerry Reynolds. LW2074 - Envelope From Tolfree's Saugus Café, 1890. BT1890 - Tolfree's Dining Room (Saugus Café) inside Saugus Depot, 1890s. BT1891 - SPRR Saugus Depot with Dining Room, 1890s. The Untimely Deaths of Emma & J.H. Tolfree News reports, 1896-97. HS2002 - Martin Wood's Saugus Café, 1914. AL3801 - MacDougall's Saugus Cafe, Matchbook Cover, 1938. HB5501 - Saugus Cafe in TV's "Highway Patrol," 2 Views, 1955. HG5701 - Saugus Cafe, Both Buildings, 3 Views, 1957-1958. OX1002 - Saugus Elementary School, Earliest Known Photo, 1910. OX1001 - Original Saugus Elementary School, 2 Views, 1910. OX2001 - Saugus Elementary School, Expansion, ~1920s. OX3601 - Saugus Elementary School, 1938 Version. OX6701 - Saugus Union School District Mystery Photo Album, 1960s. Original Saugus School Bell Through the Years • News reports, 1932-1991. LW2043 - Saugus Elementary School Bell, 8-19-1998. HB5601 - Saugus Elementary School: Kindergarten 1956. 1979 Rosedell Elementary School Yearbook. Trouble With Wobblies at Newhall and Saugus November-December 1916. LW2923 - Will the Real Buffalo Vernon Please Stand Up? • SCVHistory.com, March 2017. LW2992 - The Bogus Story of Tom Vernon and the Sweetwater Incident • Golden West, July 1967. LW2859 - Crackpot Lester F. Mead Confesses to Role in 1929 Saugus Train Robbery, 11-1929. LW2892 - Great Saugus Train Robbery with Passengers, Earliest Known Photo, 11-10-1929. FILM: Great Saugus Train Robbery (Aftermath), Pathe Newsreel, November 1929. LW2893 - Great Saugus Train Robbery: Daybreak, African American Workers, Woman with Baby, Baker Ranch, 11-11-1929. PA2901-3 - Great Saugus Train Robbery: Engine No. 59, 11-11-1929 (3 Views). PA2904-5 - Great Saugus Train Robbery: Cleaning Up the Wreckage, November 1929 (2 Views). HS2911 - Tom Vernon, aka Tom Averill, Saugus Train Robber of 1929. LW2982 - Breaking: Fugitive Tom Vernon Captured in Oklahoma; Wire Photo 12-3-1929. LW3478 - Thomas Vernon Mugshots, 12/1929. CR5701 - "Buffalo" Tom Vernon, 1929 Train Robber, After Prison Release, 3 Views, 1957-58. LW2913 - Death Certificate: Tom Vernon, 1929 Saugus Train Robber. LW2926 - The Locomotive Tom Vernon Wrecked: SPRR Engine No. 5042 in 1939. LW2949 - The Locomotive Tom Vernon Wrecked: SPRR Engine No. 5042, ~1940s. LW3260 - The Locomotive Tom Vernon Wrecked: SPRR Engine No. 5042, ~1940s-early 1950s. Future Train Robber Tom Vernon Arrested for Horse Stealing in Ventura County, 1920. RM4101 - Newhall Airport (Newhall Intermediate Field), 1930-47 (6 Views & Story). WE3001 - Saugus/Newhall Airport Map, 1930. LW2846 - Aviation Writer Devon Francis Takes First Solo Flight in a Hawley Bowlus Glider, 7-3-1941. WE4601 - Saugus/Newhall Airport Map, 1946. AP0829 - Inside Thatcher Glass, 1955. LW3270 - Hilltop/Aerial View of Thatcher Glass Mfg. Co., ~1980. Health Effects in Saugus School Children Exposed to Vinyl Chloride USEPA, 1981. Protocol to Trace Saugus School Students Exposed to Vinyl Chloride Calif. Air Resources Board, 1984. GT8604 - Keysor-Century Corp., Aerial View, ~1986. HS6006 - Corral Drive-In: 1960 Playbill. HS6007 - Corral Drive-In: Small Popcorn Bag, 1950s-1960s. HB6301 - The Corral Drive-In Theatre, Interior & Exteriors, 1963. HB6302 - Corral Drive-In Theatre Location, 1963 & 1987. HB1717 - Southern Pacific Right-of-Way & Track Map; All Property Transactions 1876-1992. AL1976 - Southern Pacific Company, Standard Time Schedules, November, 1895. AP1930 - Bercaw's General Store, July 1907. Saugus Division Aqueduct Workers Angered by Pay Cut, Spoiled Food • News reports, 1909. One Aqueduct Worker Beats, Robs Another at Saugus • News reports, February 1910. LW2735 - L.A. Aqueduct: Deadman Canyon Siphon Under Construction, Saugus, 1910. GR0804 - Ranching in Saugus, 1910. AP1924 - Downtown Saugus, 1910s. AP1924a - Downtown Saugus (detail), 1910s. ST0901 - L.A. Aqueduct Construction Headquarters at Saugus Junction, 1909. AP1925 - L.A. Aqueduct Construction Camp/HQ at Saugus Junction, 1911. LW3052 - L.A. Aqueduct Construction Headquarters at Saugus Junction, 1907-1912. LW3053 - Looking North Past SPRR Saugus Depot, 1907-1912. AL1201 - Letter of Recommendation from L.A. Aqueduct Concrete Supt., Sent from Surrey, 1912. LP1201 - Surrey Postmark, March 1912. MJ1401 - Downtown Saugus, RPPC, Surrey Postmark, Mailed Early 1910s. LW3244 - Greeting Card-Postcard, 1914. AL2014 - SPRR Saugus Depot, 1914. LW2189 - Owens Valley Water Pipeline, 1914. LW2191 - Camp at Elizabeth Lake, 6-15-1914. AL1924 - Surrey Inn in Saugus (Interior), ~1910s. HS1901 - 2 Wells Fargo Express Trucks at SPRR Saugus Depot, 1919. HS1902 - 2 Locomotives at SPRR Saugus Depot, Late 1910s. AC2000 - Downtown Saugus Main Street, 1920s. HS9023 - Renfro's Pharmacy in Saugus, mid/late 1920s. AP1907 - Kellogg Home in Saugus (Valencia), ca. 1920s. AL1924 - Surrey Inn in Saugus, ca. 1920s. AL1925 - Saugus Garage in Saugus, ca. 1920s. AL2121 - Downtown Saugus Aerial View, Real Photo Postcard (2 views), 8-3-1921. VIDEO - "The Pilgrim" (1923) Full Movie. LW2099 - "The Pilgrim": Charlie Chaplin at the Saugus Train Station, 1923 (7 Views). LW3375 - Charlie Chaplin Inside SPRR Saugus Depot in "The Pilgrim" (1923). LW2722 - Wayfinding Signs at Saugus Junction, 1926. DR2701 - Saugus Community Club House, 1927-1946. AC3101 - Downtown Saugus Street Scene, 7-25-1931. LW2946 - Snow in Saugus, 1932. LW2905 - Bear Canyon-Saugus CCC Camp (8 Views), 1935-36. LW2896 - Southern Pacific Engine No. 3674 at Saugus, 3-29-1936. AL2032 - SPRR Saugus Depot, ca. 1930s-1940s. LW3400 - Saugus Train Station (Exteriors) in "Oh, Susanna!" with Gene Autry, 1936. LW3067 - Southern Pacific Locomotive Derailed, Overturned Outside of Saugus, 3-25-1938. LW3485 - Southern Pacific Engine No. 2845 at Saugus, 5-28-1938. LW2936 - SPRR Daylight Special at Saugus Depot, May 1941. AP1905 - Destruction of F.S. Wood's Sandwich Shop, 1941. LW2059 - Southern Pacific No. 4442 in Saugus, 1941. Postcard. Film Clip - Saugus Junction with SPRR Cab Forward, Stock Footage, Late 1940s. PA5201 - Coming Into SPRR Saugus Depot, ca. 1948. HS2004 - Downtown Saugus, Mid-1950s. LW2519 - Circle J Ranch, Matchbook Cover, 1940s-1950s. LAPD Breaks Ground for Drunk Farm on Ex-Bonelli Saugus Hilltop • News Reports, October 1952. JR0100 - Recipe from the Rib Cafe. PA0100 - SPRR Saugus Depot, 1950s. LW3469 - Bouquet Junction Corners (Cafe), Matchbook Cover, 1950s. HG5704 - Wood's Garage, Late 1950s. LW2872 - Cub Scout Pack 75 (Saugus): Den Mother Certification Cards, 1957-58. SW5801 - Saugus Oil Field Map: Location of Bermite No. 1 Oil Well • Union Oil 1958. SW5901 - Saugus Oil Field Map: Location of Bonelli No. 2 Oil Well • Union Oil 1959. LW2898 - Investors Celebrate Saugus Oil Gusher, 1963. AL1965 - SPRR Saugus Depot, 1965. OX6501 - Saugus Rollerama, 1965. LW2457 - Greetings from Saugus, Calif. Plastichrome Postcard, 1965-66. LW3306 - Green Pastures Dairy: Half-Pint Milk Bottle, 1940s-60s. LW3306 - Green Pastures Dairy: Half-Gallon Milk Bottle, 1940s-60s. Green Pastures Dairy Farm (Pre-Saugus High) in "The Green Hornet" Ep.6, 1966. AL7001 - SPRR Saugus Depot in Snow, 12-19-1970. LW2249 - New-Home Billboard and Mustang Drive-in Marquee, 1973. HS7803 - SPRR Saugus District Train Orders, Nov. 9-12, 1978. HS7802 - SPRR Saugus District Train Orders, Nov. 12-15, 1978. HS7804 - SPRR Saugus District Train Orders, Nov. 15-18, 1978. LW3415 - Saugus Train Station Interiors & Exteriors in NBC's "Supertrain," 1979. JD8001 - Abandoned SPRR Saugus Depot Prior to Move, Multiple Images, 4-17-1980. L.A. Mayor's Saugus State Prison Plan Fans Flames of Cityhood • News Reports, November 1985. GT8802c - Morning Gridlock on Bouquet Canyon Road at Espuella, 2-1988. HS8901 - SoCal Edison Saugus Substation Data Sheet, 1989. Gives Edison House History. LW3141 - Future Santa Clarita Central Park Site, 1998. SC9802 - Santa Clarita Central Park Groundbreaking, 1998. LW2076 - Lombardi Ranch Fruit Label, 1999. Soledad Village by Newhall Land: Draft EIR 11-3-2005. LW2730 - Former Site of Saugus Community Club, aka Saugus Women's Club, 23027 Drayton St., 6-21-2014. HS7904 - Aerial Photos: Bouquet Junction, Saugus High School, Citation Homes Under Construction, 8-14-1979. Saugus High's Gas Lines Replaced Due to Bovine Corrosion • October 1979. HD1501 - Saugus High School, Aerial View, ~2015. HD1502 - Architect's Renderings of Saugus High School Auditorium, 2015. GT9001 - Decoro Drive Under Construction, Arroyo Seco JHS, Seco Canyon ~1990. 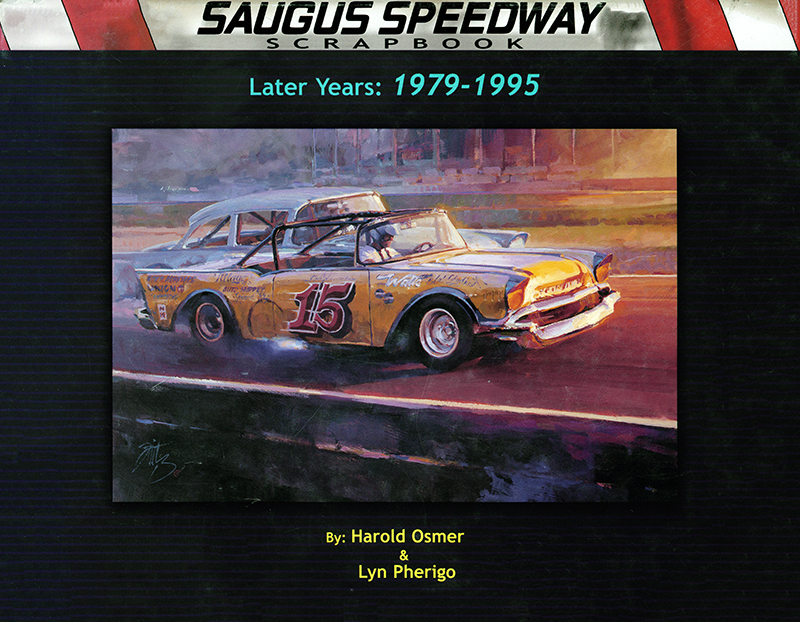 Saugus Speedway Scrapbook 1979-1995 by Harold Osmer and Lyn Pherigo (Complete). Chronological History of Saugus Speedway, published 1982. Dates of the Annual Saugus Rodeo, 1926-1960. HS1601 - Early Artist's Rendering of 1927 Baker Ranch Rodeo Arena, n.d.
Fire Claims Old Barn at Saugus Speedway, 11-21-1996 • News reports, November 1996. Video: Remembering Saugus Speedway • COC Cougar News, 6-16-2010. AL2026 - Advertising Postcard: Frank Smith Bulldogging, 1920s. AL2027 - Advertising Postcard: Smoky Branch on "Glass Eye," 1920s. AL2028 - Advertising Postcard: Ed Bowman Calf Roping, 1920s. LW2310 - Baker Ranch or Hoot Gibson Rodeo, Charles Miller Photo, 1920s-1930s. LW3411 - Annual Saugus Rodeo: End of Show, n.d., Charles Miller Photo, 1920s-1930s. LW2169 - Hoot Gibson Rodeo, Real Photo Postcard, early 1930s. LW3271 - Actor Leo Carillo at Hoot Gibson's Home (Bonelli House), Saugus Rodeo, 4-28-1935. JN3801 - Hill's Ranch Rodeo, Great Flood of 3-2-1938. LW2483 - Midget Auto Racing at Bonelli Stadium, 2 Views, 1945. LW2703 - Bonelli Stadium Photo Annual 1945-1946, with History of Midget Auto Racing. 32 Pages plus cover. HS9025 - Bonelli Stadium Pit Pass, 11-11-1945. LW3472 - Starting Lineup, Bonelli Stadium, ~1946. LW2995 - Driver Walt Faulkner at Bonelli Stadium, 1940s-50s. LW3002 - Kurtis Roadster Shown at Saugus, 1950; Jim Henning Art 2006. AP1428 - Saugus Speedway, Aerial View, ca. 1950s. LW3523 - Saugus Speedway Trophy Girl Amedee Chabot Crowned Miss California (and Miss USA), 1962. LW2811 - Bonelli House in "Fireball 500" (1966) with Frankie Avalon, Annette Funicello. 6 Views. LW3222 - Fireball 500: Lobby Cards (Full Set of 8). LW3051 - Fireball 500: Publicity Photo 1966. LW3108 - 2 George Barris Kustom Cars from 'Fireball 500' (1966). Aerial - Saugus Speedway: Aerial View, Pre-1971. HB7503 - A Young Racefan's Saugus Speedway Photo Album, 1971-1975. HM7502 - Henry Mayo Hospital Volunteer Recruitment Tea in Bonelli House, 1975. LW3343 - Bonelli Ranch: Custom Christmas Card, n.d.
HS7903 - Aerial Photos: Saugus Speedway, Santa Clara River, 8-14-1979. LW2541 - Ron Hornaday Sr., 1965 Champion. From 1982 Program Book. Video - Saugus Speedway Scene from "Charlie's Angels" Ep. 1.1: "Hellride" 9-22-1976. LW3312 - The Story of Dan Press (Valencia) • Stock Car Racing Magazine, July 1981. GT8803 - Owners Demolish Historic Bonelli Ranch House, Multiple Images, 2-6-1988. GT8902 - Dale White, No. 33 Chevelle Stock Car, ~1989. LW3005 - Jason Priestly, Charlie Sheen at Benefit for Families of Injured Stunt Performers, 1991. GT9201 - Will Harper with IROC Camaro, Southwest Tour, 9-10-1988. LW2640 - Assessor's Map: Bouquet Junction (SE Corner) & Saugus Speedway, 2008. Video - Legacy: "Sad" Sam Stanley, Saugus Speedway Racing Legend • SCVTV 2017. Bermite Predecessor: Ex-Fighter Jim Jeffries & L.A. Powder Co., 1917, • News Reports, 1915-1920. Halafax Explosives Co., Est. April 1935 (Bermite Predecessor), • Advertising & News Reports, 1934-36. Halafax Explosives Co. Display Ad; Map, Contractors, • Los Angeles Times 4-22-1935. LW2804 - Halafax Explosives Co. Advertisement, May 1935. Bermite Powder Co. Expansion • News reports 1943. About Patrick Lizza, Founder of Bermite Powder Co. • (Connellsville, Penn.) Daily Courier, 7-21-1944. LW3196 - Memo to Bermite Workers on Effectiveness of Rockets, 7-12-1945. Bermite Power Co. Advertisement • Los Angeles Times 1-2-1946. LW2107 - Bermite Powder Co. Security Guard Badge. LW2552 - Women Assemble Fuses, Bermite Powder Co., ~1955. LW2569 - Bemite Want Ad & Golden State Fireworks Ad, 1957. LW2556 - Golden State Fireworks Ad: Simulated Atomic Explosion, 1956. Bermite Powder Co. Patent No. 2869463: Delayed Firing Cartridge, 1-20-1959. Bermite Powder Co. Patent No. 2875959: Tilted Axis Muller, 3-3-1959. LW2618 - Bermite Powder Co. Want Ad, Los Angeles Exmaminer, 1-3-1961. Bermite Powder Co. Patent No. 2995088: Multi-Stage Igniter Charge, 8-8-1961. Bermite Powder Co. Patent No. 3334536: Releasable Nut with Radial and Longitudinal Lockout, 8-8-1967. 2 Killed in Flash at Bermite, 8-26-1969, • News Reports, August 1969. LW2751 - Whittaker Bermite Service Award Pendant, 12k G.F., Diamond, Rubies, 1967-1987. GT9100 - Whittaker-Bermite Site, c. 1991. Aerial Photo. Analysis of Perchlorate Containment in Groundwater Near the Whittaker-Bermite Property • CH2MHILL, 12-2-2004. Initial Site Assessments: Cross Valley Connector (East) & Golden Valley Bridge • L.A. County 2005-2006. Golden Valley Bridge Over Santa Clara River: Environmental Assessment, Caltrans & City of Santa Clarita, March 2008. LW2336 - DTSC Uses Bacteria to Rid Whittaker-Bermite of Perchlorate, 2013. Community Update: Whittaker-Bermite Facility Cleanup • DTSC, August 2017. LW3020 - USGS Maps Showing Honby, 1929-1960. HB3801 - Honby School, Student Body, 1938. HB3902 - Honby School, Student Body, 1939. Ernie Cooke & Daughter Ernestine at Balsz Ranch in Honby, mid-1940s. Tina Cooke, Charlotte Chacanaca & Susan Cooke at Balsz Ranch in Honby, late 1940s. HB6001 - Structures at Original Honby School Site, ~1960s. DM6801 - Honby Men's Club, 1968. OX7401 - Honby Elementary School Staff, 1974-75. HB7502 - Mrs. Gilbert's 6th Grade Class, Honby School, 1974-75. GZ0101 - Pam Bordelon and Jerry Koopman at Jack Lilley's Ranch in Honby, ~1976 (5 Views). LEGACY | Blazing Saddle Falls: Jack Lilley Rides • SCVTV (Video) 2017. HB1817 - Circle J Ranch & Equestrian Center: Sales Brochure & Floor Plans, 1981. HB1823 - Mountainview West: Sales Brochure & Floor Plans, 1985. HB1812 - Mountainview Courtyards: Tract Maps & Floor Plans, 1987. HB1826 - Mountainview: The Homes: Tract Maps & Floor Plans, Late 1980s. HB1827 - Oak Lane by Beazer at Circle J: Tract Maps & Floor Plans, 2000. Draft Environmental Impact Report July 2005. DEIR Appendix 4: Cultural Resources July 2005.